It's the holiday season and I now have three hats in my desserts series; a Neapolitan, a cupcake, and now a Christmas pudding hat. 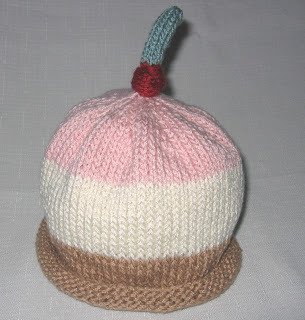 I sold the pudding hat right after I made it, but here is the picture of it. I am having trouble with the holly leaves, and am trying to find a good pattern, the rest of the Christmas Pudding hat I just made up on my own, I can post the pattern here if anyone wants it. I used my regular fruit hat leaves in the picture, but I will change it once I can make good holly leaves. I usually like my leaves to be double sided, but I may have to compromise in this case. But I have a whole year to perfect my pattern. 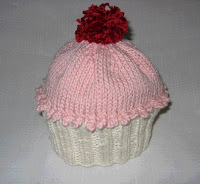 The ever-popular cupcake hat pattern is a combo of the pattern from Susan Anderson's new book, Itty Bitty Nursery and from this website: http://www.nakedsheep.com/cupcakehat.html. As always, number of stitches are a suggestion, check your gauge, and I like to think of all patterns as suggestion, not a demand. I love her patterns for inspiration, but I do like to may my own changes and adjustments. The nubbles took some working out, but then they became rather fun to make. The Neapolitan Ice Cream hat is the easiest, just three simple colors and a cherry knot top. I gave this one to my collegue who photographed her daughter wearing it and she gets plenty af awww's in it. So I know it is a keeper of a pattern. The trick is to get the ri ght number of rows for the red for the cherry. And this will vary from yarn to yarn. It is is a nice, quick, and easy novelty hat to make. But now I have to make three baskets of baby goodies for three pregnant cousins, and then it will be bunny hat season. But right now my Etsy store is a pink explosion for Valentine's day. I never knew I made so many hats with that much pink. It's almost scarry. Maybe I should invest in some anti-pink patterns, a black apple hat perhaps?